Like many families, we enjoy macaroni and cheese. I try not to depend upon the blue box, or as my kids call it, the "unhealthy" macaroni-their favorite. However, the grown-ups in the family have a favorite, creamy macaroni and cheese recipe and the children still gobble it up. This macaroni and cheese recipe is very creamy. Once I doubled the amount of pasta but not the cheese sauce when making it for ourselves and a friend...and it was still delicious (and my friend didn't think it was dry). I don't recommend it though for the full tasty goodness. 1. Cook pasta according to directions with the salt. While pasta is cooking prepare the cheese sauce. 2. Microwave broth and milk for 2-3 minutes in a large glass bowl. Handle with care. It will be steamy hot. 3. Melt butter in a large saucepan over low heat. Whisk in flour, pepper, and the hot milk mixture. 4. Cook over medium heat for 3-5 minutes. Stir or whisk frequently. 5. When mixture has thickened, add Parmesan cheese. Stir. 6. Turn heat off. (If using sliced cheese keep heat on lowest setting.) Add cheddar cheese and stir until melted. 7. Combine pasta and cheese sauce. Serve warm. Hearty. Cheesey. Delicious. Try it! Did you know that I don't shred cheese? Another fabulous macaroni and cheese recipe is our creamy ham and mac recipe. Delicious! This recipe was adapted from this one. I love homemade mac and cheese! Way better than the box. There is nothing better than homemade macaroni and cheese. I love how you get to decide the creaminess of it! 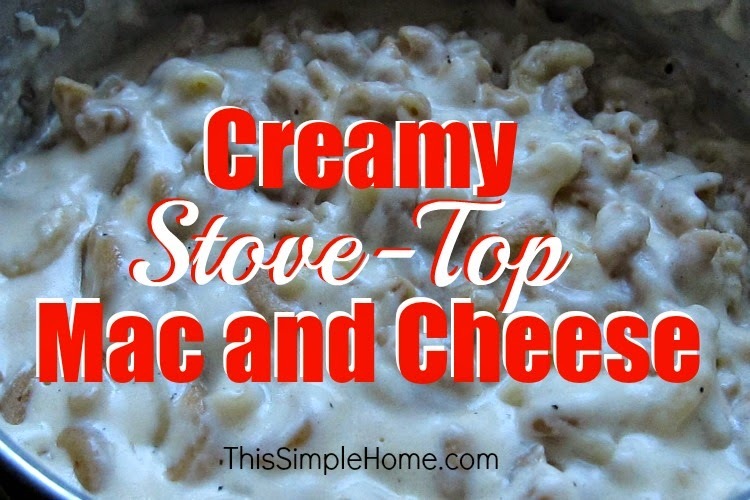 I usually bake my macaroni and cheese so I look forward to trying your recipe in order to save a bit of time. Thanks for sharing! I've only made it with Velveeta. I've been looking for a cheddar recipe. Pinned! Oh fantastic! I once found a recipe that I loved for homemade mac-n-cheese and then I lost it. Glad to have this one! Because I think the homemade variety is much more yummy! This looks really good. My son was asking for homemade mac n' cheese. I will have to try this weekend.